Flag. It’s a destination, not a place. It’s a destination, not a place. Clearwater, Florida, is the Pinellas County seat, one of the Tampa Bay area’s three principal cities, and the Guinness World Record holder for the most days of consecutive sunny weather (361). But arguably more than any of those things, Clearwater is the international spiritual home to a major religion, the Church of Scientology. For both, Clearwater and Scientology, the past year has been transformative. Symbolizing their parallel trajectory is a building, a cathedral for the Church and a pivot point for the city. Its foundation, beneath the concrete and steel, is the Scripture of Scientology, its spiritual processes—made ready and available for Scientologists who travel to Clearwater from around the world for advanced religious study that can happen only here. If you are a Scientologist, from Day One you are destined to come to Flag. The rich narrative of the Scientology Flag Land Base has deep historical underpinnings in the Florida Gulf Coast town. The site of Clearwater was the ancient home of the Tocobaga tribe; it was settled as an Army outpost during the Seminole Wars; the town was frequently sacked by Federal gunboats during the Civil War; it became a terminal for one of the late 19th-century railroads that brought wave after wave of tourists to Florida; a landmark hotel, the Fort Harrison, became the city’s gleaming architectural jewel, and was de rigueur with the tuxedo and flapper crowd in the Roaring ’20s. Clearwater, typical of many Florida coastal burgs, was swept by recurrent economic booms and busts in the early and mid 20th century, and a slow downward spiral stripped the city’s luster. By the 1960s, Clearwater’s downtown—which never ceased to be blessed by sun, sand and, of course, clear water—had nonetheless lost its mojo. The Church fully restored the historic Fort Harrison in 2009. Its shine today rivals that of the day the hotel first opened its doors in 1926. It continues to serve as a community hub and a religious retreat for Scientologists. Then, in 1975, the Church of Scientology arrived, acquired and subsequently fully restored the then-declining Fort Harrison and the historic Clearwater Bank building. Over the next four decades, the Flag Land Base grew to comprise more than 50 structures populated by 2,300 Church staff members. In the same period, other Scientologists living in Clearwater grew from zero to more than 10,000, with many more thousands of Scientologists visiting Clearwater each year for religious education and services. By the late 1990s, it was clear that Scientology and Flag were firmly rooted in the area. The Church had flourished—but was that sufficient? So far, repurposing buildings for Scientology had been a very successful strategy. Indeed, many historic structures—from Sacramento to Washington, D.C., to England to Italy to Africa and more—had been transformed into Scientology Churches. 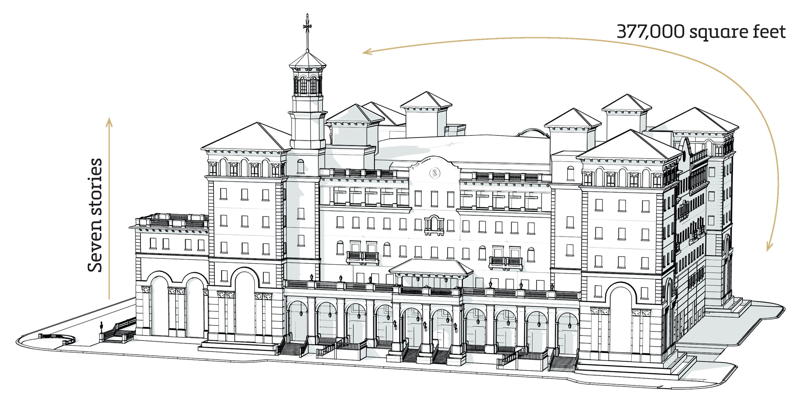 Yet in Clearwater, the religion’s spiritual capital, there was no building that could be described as “designed bottom-up for Scientology.” A vital facility remained to be built—a single building designed to exact specifications. It had to be large enough to provide adequate space so that thousands of staff and parishioners from around the world could be engaged in Scientology religious services at the same time. The building also needed to be configured for the highly unique religious services known as the Super Power and Cause Resurgence Rundowns, researched by Mr. Hubbard and now fully available to Scientologists for the first time. Designing and building this proper facility—a cathedral that was “pure Scientology” —was essential to accommodate the numbers of parishioners and to realize and deliver these special rundowns. The process from vision to concept to construction to opening of the cathedral spanned a decade, with tens of thousands of Scientologists contributing in some form to the endeavor. It would be known as the Flag Building. More than 10,000 Scientologists and guests gathered on November 17, 2013 for the dedication of the Flag Building. Mr. David Miscavige led the dedication ceremony of the Flag Building. “Your cathedral has risen and your spiritual headquarters is now open,” he said. Bronze sculptures portraying key principles of the Scientology religion line the cathedral’s grand atrium, which is 40 feet high and spans the length of a city block. In the first year of that eternity, the new Flag Building has indeed been imbued with life, serving thousands of parishioners in dozens of languages and drawing accolades from both within and without the community of Scientology. But for those close to it, such as Lena Pirak, the cathedral is the ultimate in a Scientologist’s dream come true. A free-standing sculpture 35 feet high depicts the Scientology Emotional Tone Scale, showing the progression upward from death, culminating in a translucent figure depicting serenity. The new Flag Building comprises 377,000 square feet—an entire city block, six stories, a below-ground floor with staff dining facilities, and four tower suites, one at each corner of the cathedral. Topping it all is a giant, eight-point Scientology cross. Scientologists bringing a guest to the Flag Building for the first time often opt for a dramatic entrance across the street bridge from the Fort Harrison religious retreat. The elevated walkway resonates for Scientologists with a scriptural meaning of the word “bridge.” Man and religions have long envisioned and described a bridge across a chasm between earthly survival and a higher plateau of spiritual existence. In the Scientology religion, The Bridge to Total Freedom is an exact route with precise procedures that Scientologists traverse on their spiritual path. The interior of the skywalk from the Fort Harrison into the Flag Building is crafted entirely in marble, the whole way of it flanked by flowers. Then it opens into a breathtaking view of the cathedral’s Atrium, a majestic and towering space that’s three stories high and spans nearly a city block. The space of the Atrium is commanding, and its contents—even more so. A series of bronze sculptures representing various aspects of Scientology run the length of it. Its centerpiece is a floor-to-ceiling spiral depicting the Scientology Emotional Tone Scale in life size and three dimensions. At the bottom are darker figures that indicate spiritual death and apathy, rising to other, brighter statues that show people becoming progressively free, and at the summit a brilliantly translucent crystal figure glistens with serenity. Along the Atrium’s longest side are more sculptures denoting other aspects of the religion. These include tableaux showing the Eight Dynamics—the quests for survival for self, for families and creativity, for groups, for all Mankind, for all life forms, for the physical universe, for the spiritual realm, and finally for the Infinite, the Supreme Being, God. On the ground floor, a large information center with multimedia displays includes 600 films in dozens of languages. They present the fundamentals of the religion and update visitors on the humanitarian and social betterment programs sponsored by the Church around the world. A museum of the Church’s religious order, the Sea Organization, includes Mr. Hubbard’s office and research room from the Apollo, the flagship of a flotilla where he first researched and explored the highest spiritual levels of Scientology. Authentic in every detail, the office features elements as precise as the two types of Spanish marble matched to the original floor. Elsewhere in the Flag Building are classrooms, educational film rooms, auditing rooms, lounges and a cafe. And large spaces are devoted to the two new religious services, Super Power and Cause Resurgence, that became available only with the opening of the building and its space tailored for their delivery. Each week, more than 2,000 Scientologists participate in the spiritual services offered in the Flag Building. 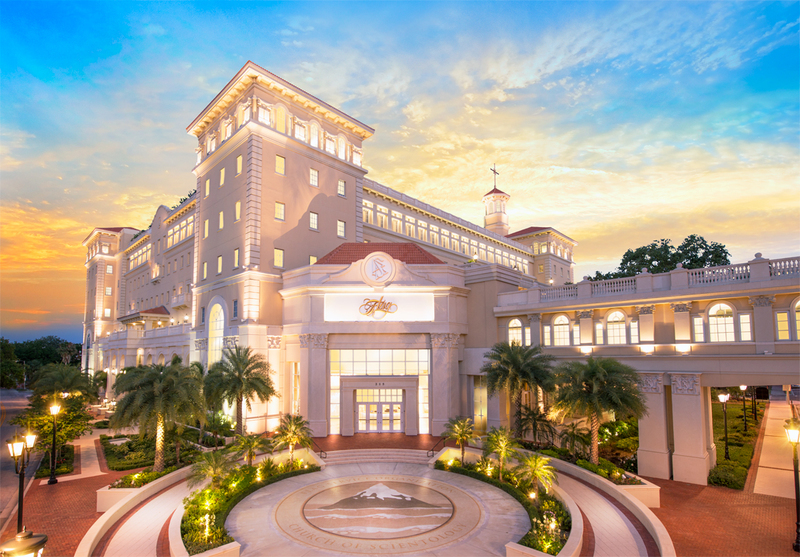 The opening of the Flag Building coincided with an equally special event for Scientology—announcement of “Golden Age of Tech Phase II,” a years-long project to review and reconcile L. Ron Hubbard’s vast body of literature and policies that describe and define how Scientology is taught and administered. It was the largest training program and most massive production of technical and administrative materials in the Church’s history. Golden Age of Tech Phase II followed closely on the heels of the Golden Age of Knowledge—a massive undertaking that involved the audio restoration of nearly 2,500 of Mr. Hubbard’s lectures on Scientology and Dianetics. These lectures form the Scriptural foundation of the religion. Today, at any one time, thousands of Scientologists from all corners of the world—New York to London, Moscow to Rome, Kaohsiung to Sydney—are on services at the Flag Land Base, progressing up The Bridge to Total Freedom on their step-by-step spiritual advancement. Since the ribbon fell on the Flag Building, more than 6,800 Scientologists have passed through its portals to complete one of the many religious services available here that are the Scientology Bridge to Total Freedom. All of this is possible solely due to the Golden Age of Knowledge, Golden Age of Tech Phase II, and the Flag Building, both its physical facilities and what it represents as the spiritual headquarters of the religion. Mr. Miscavige gave expression to the first 12 months of this phase of the Scientology Golden Age: “After one year, the Bridge with Golden Age of Tech Phase II presents an unprecedented perspective—an auditing or training completion every four minutes, and the number of those advancing up The Bridge 52 times any time in Scientology history.